Hi Graham, One thing I learnt many years ago when making muffins. 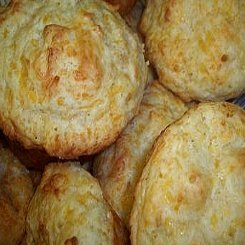 Whatever you are adding to them, like cheese etc, add it with the dry ingredients then it will never sink and will be evenly distributed through the muffin. Never, ever over mix muffins. I learnt the hard way. Just a light mix until wet & dry ingredients blend. Have a good day. p.s. I am new to your site & find it very interesting, well done. Thanx for the great recipe Graham.Just made a batch now. I used half gouda cheese and half feta. Great recipe on the crumpets. I just tried it….. Looks like… I will be making a few more batches of that for winter. Hi Graham, I’m so glad you r back! Hope u r well. I must admit I love winter, but I don’t even know what to cook for the kids. They get tired of the same things I cook them everyday. But these muffins I’m trying them this weekend and they seems so easy. I’m a terrible cooker but your recipes are helping a lot. Tks a mill! Do you add the cheese when you add the butter?